(Phys.org)—Sweden is hungry for trash and has turned to Norway for an offer it would find hard to refuse, no pun intended. Sweden is asking its neighbor for trash. Sweden's success is Sweden's problem. Sweden is a model recycler. Thanks to a highly efficient waste management system in Sweden, the vast majority of this household waste can be recovered or reused. As a result, Sweden has run short of garbage. Since it does not produce enough burnable waste for its energy needs, Sweden is suffering a downside to being such an enviable model of recycling. The average in Europe of trash that ends up as waste is 38 percent. Sweden's is 1 percent. The numbers are from Eurostat, which said only 1 percent of waste from Swedish households ends up in landfill, in contrast to 38 percent for European countries. In Sweden, some of its waste is either recycled or is composted. 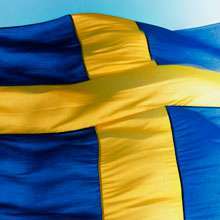 Sweden has turned to neighboring countries for their excess waste. Sweden is on an import drive of eight hundred thousand tons of trash from the rest of Europe per year to use in its power plants. Much of the import is coming from Norway. The waste is to satisfy Sweden's Waste-to-Energy program, with the end goal of converting waste into heat and electricity. Norway is amenable to the agreement as exporting a portion of its trash is more economical than having to burn it. In the plan, toxic waste, ashes remaining from the incineration process, filled with polluting dioxins, will be returned to Norway. While tapping its European neighbors for their garbage might seem unusual, Sweden does not consider itself such an odd duck; rather, as a forward-thinker when it comes to energy efficiencies and the use of waste to supply people's energy needs. For Sweden, burning garbage in incinerators generates district heating, where heat is distributed by pumping heated water into pipes through residential and commercial buildings. It also provides electricity for homes. Sweden's strict standards limit emissions from waste incineration and most emissions have fallen considerably because of technical development and better waste sorting. Earlier this year, Catarina Ostlund, a senior advisor for the Swedish Environmental Protection Agency, said that in the future, waste will be valued even more. "Maybe you could sell your waste because there will be a shortage of resources within the world," Ostlund said. Beyond Norway, Sweden eyes Bulgaria, Romania, Italy and the Baltic countries as possible options for garbage; they are countries that "landfill" a higher percentage of waste than Norway. "I hope that we instead will get the waste from Italy or from Romania or Bulgaria or the Baltic countries because they landfill a lot in these countries. They don't have any incineration plants or recycling plants, so they need to find a solution for their waste," she said. Except that we haven't been socialist for much of the last decades, and certainly not now. Recycling is market driven now. Really a good news story. See, it can be done! yea yea, sweden burns its waste in high temperature burners. there is mixed acceptance of this practice. and the 'greens' claim that even the highest quality burn results in large spewing of dioxins and other toxic chemicals that don't get fully combusted being turned into the air. it's a thought. this 'article' is mostly a bunch of money washing and doesn't elucudiate the garbage problem. yea , you can burn it. people talk about the problems' of burning fossil fuels. the big advantage to burning garbage is that you don't have to pay for the cost of shipping and burying it. whereas fossil fuels are already in the ground and don't need to be disposed of. garbage is a tricky problem and the low hanging fruit exists in making laws preventing excess disposable product usage. preventing garbage is the first line of defense against toxifying our own environment. some garbage will always exist and then the question is how to deal with it. I assumed that the waste that does go to landfill is the mostly volatile stuff - large quantities of plastics, for example, as well as batteries and items along those lines. They don't really explain their process, but all the food and paper waste could be easily burned cleanly. Unfortunately, food and paper are not big issues in landfills as they're the most easily broken down by microbes, and have the least environment impact, so the point is fairly moot. In Sweden we actually recycle or burn most of our plastic. Here are some statistics for household waste in southern Sweden. It might seem that way at first, but landfill is pretty compacted (i.e. anearobic). 'Archaeological digs' in modern day landfills have shown that newspapers deposited a century earlier are still very much intact. Sweden (and many other nations) already have a good record at separating out paper and biologicals. Those mostly don't end up in the burners for these types of powerplants, anyhow. The powerplants burn mostly plastic waste. I think Sweden is really showing us what can be done (with minimal effort by the citizens) in tersm of sorting and prevention. Seeing as other countries have a hard time finding new places for landfills (and the running costs associated with them) recycling is definitely the way to go. I take my hat off to Sweden. A very advanced country. So what happens when everyone starts being "highly-efficient" with their waste, and they can no longer ask other countries for it? Buy it from the dummies in the USA who don't WANT to recycle. They can take our trash, it could help get our economy back in order. We can start selling our landfills and we could redo our own land. 1 Billion a year to transfer and export our trash sounds about fair. They get energy we get green. It will also "create jobs" Everybody wins! The reason why Sweden is looking nearby instead of taking trash from the USA for example is shipping is NOT free. Shipping trash across the Atlantic would probably nullify any economic benefit thanks to the tremendous amounts of fuel required to do so.